Really, anything by Walker’s is on my list of favorites. But at the holiday, there is nothing better (except maybe my own Christmas Shortbread cookies!) than Walkers’s Mincemeat Tarts. 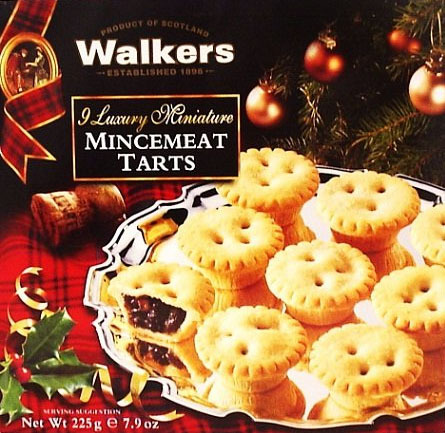 For me the spicy taste of mincemeat (apple, currants, sultanas and candied citrus peels) wrapped in that buttery, rich and flakey Walker’s shortbread deliciousness makes for the perfect little holiday accent at a party or after a meal. Or you can just add a ribbon to a box of them and you’ve got a much appreciated gift! I confess that I heat them with a little butter on top and jot of whipped cream to add a little Christmas accent to breakfast! This year they’ve even added a Glenfiddich version if you’re so inclined, but honestly, I can’t imagine that they can be improved. You can try buying just a one box, but trust me, that’s not going to be enough! I get the twelve pack just to be sure I’m covered from Thanksgiving to my New Year’s buffet – not to mention the rest of the year! !